Panel-mount a USB-B port, for easy access. The USBPNLBFBM3 3ft Panel Mount USB Cable features one USB-B male connector on one end and a USB-B panel mount female port on the other, providing a convenient solution for custom enclosures (e.g. internally mounted hard drives).Offering 3ft in cable length, the adapter allows you to extend the connection as needed within the system case. 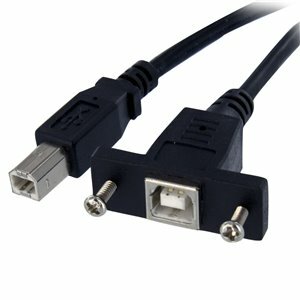 Offering three feet in cable length, the adapter allows you to extend the connection as needed within the system case. Customize your solutions by mounting a USB-B port to your custom enclosures. Configure your systems as needed, and extend your USB-B connection by three feet with this reliable cable.